Nicholas of Myra (Greek: Νικόλαος, Nīkolāos; "name means::victory of the people"), (ca. 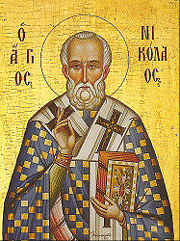 Born::270 AD-Died::December 6, 343 AD) was a bishop of Myra in Lycia during the 4th century, a delegate to the Council of Nicaea, and a true champion of justice. However, today most people know him by his common name Saint Nicholas, the name attached to Santa Claus—the mythical figure with a reputation for secret gift-giving on Christmas day. Many Christians view Santa Claus as God-substitutionary figure who bestows rewards according to works rather than grace. One of Nicholas' first acts upon his return seems to have been the destruction of multiple pagan shrines and temples. Chief among these was the Temple of Artemis. Contemporary accounts state that these shrines and temples were infested with demons. Nicholas fought as hard as he could to throw these buildings down, in a manner that would have pleased Kings Hezekiah and Josiah of the Kingdom of Judah, and possibly the Prophet Elijah. Demons or no, Nicholas' reported actions in destroying these temples are probably real enough, and indicate that Nicholas was as militant as he was generous and charitable, when he felt that militancy in the service of God was called for. Nicholas' career as Bishop of Myra was quite illustrious. Multiple accounts credit him with relieving a famine in Myra (311-312 AD) by requesting donations from several grain-laden ships in the harbor. The accounts state that Nicholas promised the crews of those ships that their donations would not be missed at destination—and miraculously, they were not, even though Nicholas had quite enough grain to see the people through two years of famine and even to plant a new wheat crop at the end of that time. Nicholas is well-attested as having attended the Council of Nicaea in AD 325. One account, which might or might not be completely accurate, states that Nicholas confronted the famed heretic Arius (who denied the Trinity), even going so far as to slap him across the face. For this Constantine temporarily relieved him of his bishopric and even had him imprisoned for a brief spell. The account also says that Nicholas was eventually reinstated. Every country in the Western world has a myth about a giver of gifts, who enters homes by stealth, leaves generous gifts, and departs as secretly as he came. In Great Britain this figure is called "Father Christmas," and in France, Père Noël. The Dutch call him Sinter Klaas, which is the literal translation of "Saint Nicholas" in Dutch—and in the United States, thanks largely to popularizers like the author Washington Irving, he is called "Santa Claus," a corruption of the Dutch name. In Germany he is known as "Kris Kringle," which is a corruption of the German name Christkindl, literally "Christ child." Perhaps by no accident, "Kris Kringle" is always associated with the cone-shaped "Christmas tree," or Tannenbaum, which is a German invention that itself traces to a pagan practice that began in that region. They debase the memory of a truly dedicated servant of God, one whose life was illustrious enough without the legends of immortality and God-like power that now attach to his name. They set a precedent for telling a highly elaborate lie and thus undermine their moral authority and that of the entire adult establishment in which their children grow up. This page was last modified on 11 July 2011, at 10:05.